McCOR Management creates extraordinary retail environments for investors, retailers, shoppers and communities. We consistently achieve this by being at the forefront of evolving consumer demand, retailer strategies and the trends that affect the retail landscape. This gives us the unique expertise to adapt quickly to the singular challenges of any retail development, from streetfront sites to large-scale mall projects across Canada. Underpinning this expertise is a powerful ten point process that ultimately enables us to attract the right tenant for the right space and ensures our clients assets deliver optimal long-term returns. We are a trusted voice for our retail clients. Our advice is grounded in a clear understanding of their investment or business objectives, and an unwavering commitment to using our retail expertise to create value at every opportunity. We act as a partner to tailor and execute solutions that meets their specific performance goals and we have the in-depth expertise to manage the complete process from conception to full-occupancy. We look to form trusted, long-lasting relationship so that we can put our retail intelligence to work to benefit clients as market conditions change and new opportunities emerge. 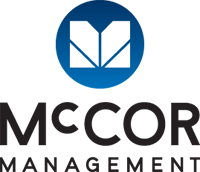 Where McCOR Management’s experience really sets it apart is in the creation of tailored approaches that create value in challenging circumstances. In short, we are experts at turning potential issues into opportunities. Whether leveraging our national and local network of retailers to achieve full occupancy before a sign has been erected; or repurposing space to successfully attract premium tenants; our ability to facilitate outcomes that surpass expectations puts us in a unique position amongst retail real estate managers.